I saw this buck last year on October 15, 2015. But, never saw him again. Last week I saw him wake up from his bed of 12 feet tall thickets and walk diagonally away from me two days in a row. I decided to move my stand 60 yards to the south. Two days later he was broadside at 35 yards. After I hit him he lumbered right back where he came from, and expired right in the bed he woke up in, 60 yards away. My plan worked out perfectly. My second bow harvest after a spike 7 years ago. Long awaited trophy. My biggest deer overall by 6 points and 60 lbs. 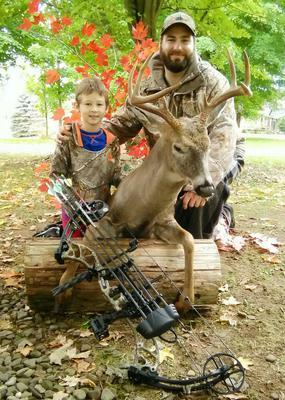 This Victor, NY buck ended up being a 10-point 170lbs dressed. 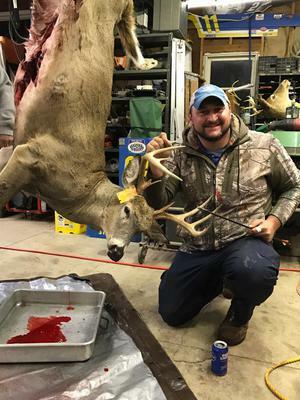 8-point arrowed opening day 2016. My First archery buck from the ground. Chautauqua Co.